The Orange Grove Center for Corrective Eye Surgery was founded in Tucson, Arizona in 1983 by Robert M. Kershner, M.D., F.A.C.S. Today we are called the Eye Laser Center to better reflect the advances in technology that allow us to diagnose and treat many common eye diseases with laser technology. Our offices are located on the third floor of the Orange Grove Medical Building at 1925 West Orange Grove Road in Tucson, Arizona. Serving the entire southwestern community, the Orange Grove Center for Corrective Eye Surgery and Eye Laser Center has hosted patients from all over the world including doctors, nurses, lawyers and professionals, as well as celebrities in sports and acting. We offer a full range of ophthalmological services and the latest in high technology diagnosis and imaging systems. Welcome to the Eye Laser Center. We are located on the third floor of the Orange Grove Medical Building on Orange Grove Road, east of La Cholla Boulevard, on the rapidly growing campus of Northwest Medical Center. We specialize in the surgical treatment of cataracts, excimer laser (LASIK) for nearsightedness, farsightedness and astigmatism, corneal transplantation, laser surgery and the surgical and medical treatment of glaucoma. If this is your first visit with us, please fill out a patient information sheet, on which you can list any surgeries or illnesses you have had, any medications you may be taking including eye drops, allergies to any medications, and the name of your regular doctor. You can do this in writing on our office form or you can fill it out on line at our website. Plan on approximately 1 hour for the examination. Eye drops will be used to dilate the pupils and for glaucoma testing. It is helpful to have a friend or family member drive. Bring your present eyeglasses with you and sunglasses for use after the examination. If you are a contact lens wearer, please leave your soft contacts out for at least one week and hard contacts for three weeks prior to the examination. We will measure your vision, determine the proper prescription for glasses (refraction), test your pupils, eye muscle balance, side-vision (visual field) and perform tests for glaucoma (eye pressure). We will then dilate your pupils with eye drops and the physician will perform a complete microscopic examination of your eyes, inside and out. We will provide you with the most complete medical eye examination possible. Our Office Hours are Monday through Friday, 8:00 a.m. to 5:00 p.m. Appointments can be made by calling (520) 797-2020 or by contacting us through this website. Emergency eye care is provided on a 24 hour basis. Should you have an eye emergency or injury call (520) 797-2020. The physicians at the Eye Laser Center accept Medicare assignment and our office files Medicare claims for our patients. We participate in most insurance plans, so please bring your insurance information and cards with you. Our office accepts most credit cards and has financing plans available, so please ask if you would like to talk with one of our counselors about alternative payment options. The doctors and staff of the Eye Laser Center want you to be fully informed about your eyes and your vision. We enjoy answering questions about your eye health, so please feel free to ask. Patient informational displays and educational literature are available in our reception area. Our educational lounge has continuous showings of videos for those interested in learning more about small incision, no injection, sutureless cataract surgery, excimer laser vision correction (LASIK), the latest procedures for nearsightedness, farsightedness and astigmatism and ways in which modern eye surgery can allow you to become free from eyeglasses or contact lenses. A complimentary evaluation is available to see if you are a candidate for LASIK. Our experienced, courteous, dedicated, and friendly staff want your visit with us to be as comfortable and pleasant as possible. If there is anything we can do to help you, please do not hesitate to ask. Most of us have had laser corrective eye surgery ourselves so you can feel free to ask us about our experiences with this newest technology to free people from eyeglasses and contact lenses. If however, you need glasses, and want to continue wearing them, we do have a wonderful independent optician adjacent to our offices at Orange Grove Optical, Suite 305. A courtesy telephone, hearing device for the hearing-impaired and wheelchair are available upon request. We have gone to great lengths to make our offices free from barriers to the handicapped and the disabled. Our staff is highly trained and experienced. Along with our physicians, our certified ophthalmic technicians are always willing to assist you and help answer your questions. We are proud of our staff and want you to get to know them. Take a minute to view our photographic gallery in our reception area and know why we are proud of who we are. And if we do the best job possible of providing you with the most comprehensive eye examination you have ever had, in the most pleasant surroundings with the best staff you have ever known, tell your friends...if we fail you in any way, tell us! Change the way you SEE...and change your LIFE! Robert M. Kershner, MD, FACS and Chris M. Seniw, MD are two of Tucson's most experienced refractive specialists helping thousands of your friends and neighbors to see more clearly without the dependence on eyeglasses and contact lenses. Shop around, but stop here. You will find the most qualified specialists, the best staff and the happiest patients. 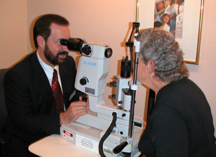 The Eye Laser Center-Tucson, Arizona USA Call or Contact us through this site NOW! This website is intended for educational purposes only. It is not a substitute for medical advice from a physician. To schedule an appointment with one of our medical doctors, contact us on line, by phone (520) 797-2020 or fax (520) 797-2235. Use of this site constitutes an agreement with the user that releases the Eye Laser Center and Robert M. Kershner, MD, PC from any and all liability. Robert M. Kershner, M.D., P.C., F.A.C.S.